Does It Matter if the Justice Department Calls Anti-Abortion Violence ‘Domestic Terrorism’? Pro-choice groups are pressing the Obama administration to ratchet up its response to a surge in attacks and threats to abortion providers. A shattered window, a makeshift bomb, and then a fire in California. A car set ablaze in New Orleans. A fire in Washington state. A hatchet attack in New Hampshire. 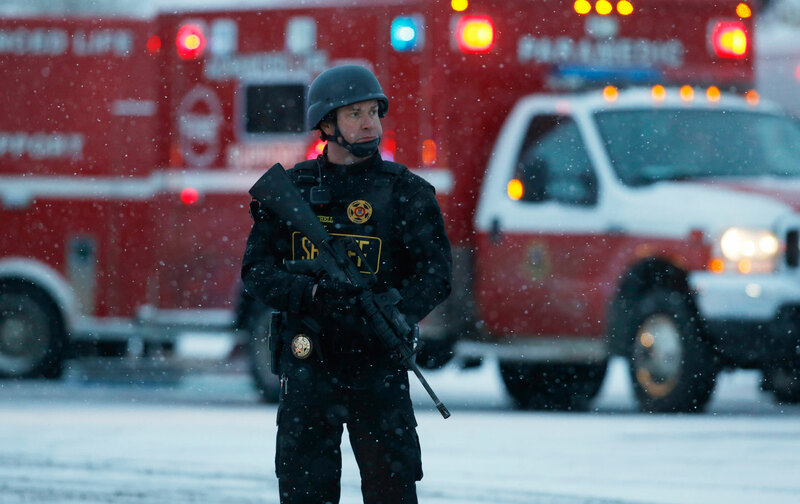 Just hours before a gunman staged an hours-long siege at a Planned Parenthood clinic in Colorado Springs, over 140 public health and pro-choice groups sent a letter asking the Obama administration to investigate a surge in attacks and threats to abortion providers, arguing that the incidents were “not just acts of hatred and violence but acts of domestic terrorism.” The letter linked the violence to the series of heavily edited undercover videos regarding Planned Parenthood’s tissue-donation program that an anti-abortion group began releasing in July. The Federal Bureau of Investigation defines domestic terrorism as acts “intended to intimidate or coerce a civilian population” and “to influence policy of a government by intimidation or coercion.” The Colorado shooting, and clinic violence more generally, clearly matches that description, Hogue argued. Two-thirds of people polled recently said they thought clinic attacks were a form of terrorism. But domestic terrorism is not of itself a crime; ideologically motivated criminals like Oklahoma City bomber Timothy McVeigh are typically charged with murder, use of a weapon of mass destruction, or hate crimes. Robert Dear, the alleged Colorado Springs gunman, faces first degree murder charges. Attorney General Loretta Lynch referred to the shooting as an “unconscionable attack,” and the Justice Department is still weighing the option to press federal charges. So does it matter whether the DOJ calls clinic violence domestic terrorism? It’s important, Hogue said, “to reframe the way we talk about these atrocities in our society, and discourage others [who think their] actions will not be met with the level of seriousness deserved.” Beyond rhetoric, there are also practical reasons why pro-choice advocates want the government to put anti-abortion violence under the terror umbrella. Last month, the DOJ announced it would appoint a “domestic terrorism council,” signaling a pivot from a focus on international groups. Advocates want to make sure that attacks by anti-abortion extremists are given the same priority status as other homegrown threats, and the accompanying law-enforcement resources. The Department of Justice already has a Task Force on Violence Against Health Care Providers, which was formed in 1998 after the murder of Dr. Barnett Slepian in New York. The task force’s duties include coordinating federal prosecution of crimes that violate federal arson laws, firearm statutes, and the Freedom of Access to Clinic Entrances Act, which bars violence, threats, and obstruction intended to prevent women from accessing, or doctors from providing, abortion care. The task force falls within the DOJ’s civil-rights division, and so what groups like NARAL are asking is for the national-security division to get involved, too. Not all pro-choice groups think that would lead to more effective investigations, and expanding the government’s counter-terror apparatus raises some civil-liberties concerns. “I don’t think that we necessarily want to go to another division where they’re not familiar with our issues and cases and where we…would be competing for scarce resources with all the other kinds of domestic terrorism threats that might be prioritized,” Vicki Saporta, president of the National Abortion Federation, told Slate. There’s little debate within the pro-choice community that attacks like the one in Colorado are meant to sow terror, regardless of what they’re called. Threats made to women’s health centers were on the rise even before the Center for Medical Progress began its video smear campaign: Between 2010 and 2014, the number of clinics impacted by intimidation doubled. Now the threats have become too numerous for providers to handle on their own, and that undoubtedly has an impact on how they operate. One provider reported to Katha Pollitt that “10 to 15 percent of our resources of time, talent and treasure are devoted to compensating for harassment and threats.” As Ultraviolet’s Thomas put it on Wednesday, women have a constitutionally protected right to abortion—except, right now, it’s not protected.